The oldest surviving church constructed specifically for the use of the Protestant Church in the east of County Galway is that erected in what would become the village of Eyrecourt at the expense of the Cromwellian Captain John Eyre. [i] Its founder had been the beneficiary of significant lands granted by the Cromwellian authorities in the east of the county in the mid seventeenth century, much of which had formerly been in the possession of various Maddens, Horans and other families long established in the region. In the midst of hostile neighbours and an uncertain political climate John Eyre sought to consolidate his hold on his lands as early as possible and began construction work on the building of a large county seat for himself at the townland of Killenihy or ‘Killeno’ in the parish of Donanaughta. [ii] The mansion, called Eyrecourt Castle, was built on the grounds of a long robust two-storey early-seventeenth century house, formerly the property of a dispossessed branch of the O Maddens. The existing house was retained and incorporated into the collection of ancillary buildings to the rear of the new house. Despite the Restoration of the monarchy in the person of King Charles II in 1660 Eyre managed to retain ownership of his estates in east Galway and by 1677 had constructed a small Protestant chapel in close proximity to a small ringfort or lios known as Killinehy or Killelehy fort and at what would be one of the entrances to his residence to serve the needs of his family and a small community of Protestant settlers whose presence he had facilitated in the area. In view of Eyre’s building of this church and having ‘brought several Protestant families together’ ‘and in order to promote and encourage an English plantation there’ the King by patent dated 5th February 1679 created Eyre’s lands and others at Eyrecourt into ‘the Manor of Eyre-Court, with five hundred acres in demesne; power to create tenures; to hold court leet and baron and a law-day or court of record; to build a prison; to appoint seneschals, bailiffs, gaolers and other officers; to receive all waifs, estrays, fines, &c.; to impark five hundred acres in free warren, park and chase; to hold a market on Wednesday and two fairs more on 29th June and on Thursday after twelfth day, and the day after each at Eyre-Court.’[iv] The grant of 1679 significantly altered the landscape about Eyrecourt thereafter. His new mansion, built in an architectural style new to the country and situated as a classical object in an ordered and landscaped demesne, announced his arrival as a significant landed proprietor and the arrival of a new order in the county and country. The demesne lands he created lay principally to the north and east of his mansion, while on the edge of his demesne a small planned village developed, its main street leading to the western gates to the demesne. The demesne itself was composed of several earlier townlands and denominations whose names were later went out of use and Eyre’s church was located on the boundary of that demesne with the village but within the confines of the demesne. A small community of minor Protestants was evident at an early stage in the life of the village who would later be buried in the small graveyard about Eyre’s church. Among the earliest buried there, with the exception of the Eyre family, were Henry Canneville, who died in 1719, at the age of 90 years and James Banco, who died, aged 74 years, in 1722. With the exception of a small number of Protestant families who settled locally in the early seventeenth century but who suffered persecution at the outbreak of the 1641 Rising, their age would point to these men as having been among the first of a minor class of Protestants who settled in and about the village in the mid to late seventeenth century. While it is possible a small cluster of houses may have existed in close proximity to the earlier house of the Maddens at Killenihy the village which developed about the western gates of the demesne appears to have been one of the first planned villages in east Galway. Following the sale of Eyrecourt Castle and demesne in the early twentieth century and the departure of the Eyres in the 1920s, the ruins of the 1677 church and the graveyard whereupon it stood became a part of the property of the family who acquired the castle. 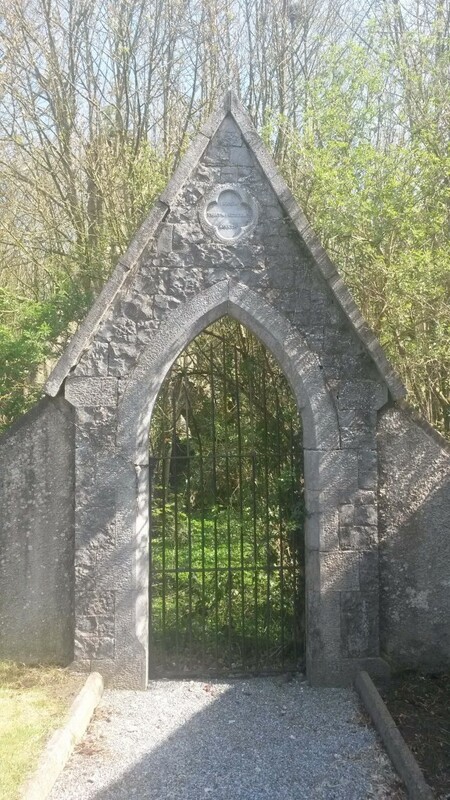 Over succeeding decades Eyrecourt Castle fell into a ruinous state and the condition of the small church at the entrance gate between the demesne and the village grew progressively worse and its graveyard overgrown with saplings, bushes and nettles. 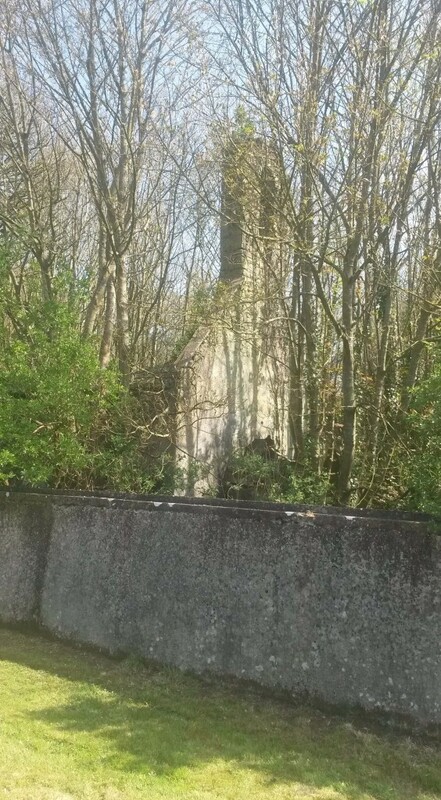 The classically-designed stone piers whereupon were hung the gates at the eastern entrance to the demesne were sold in the late twentieth century by the landowner but were subsequently bought from the purchaser by the local community through the Eyrecourt Community Group who, after negotiations with the landowner, had them re-erected at the eastern, village entrance to the demesne. 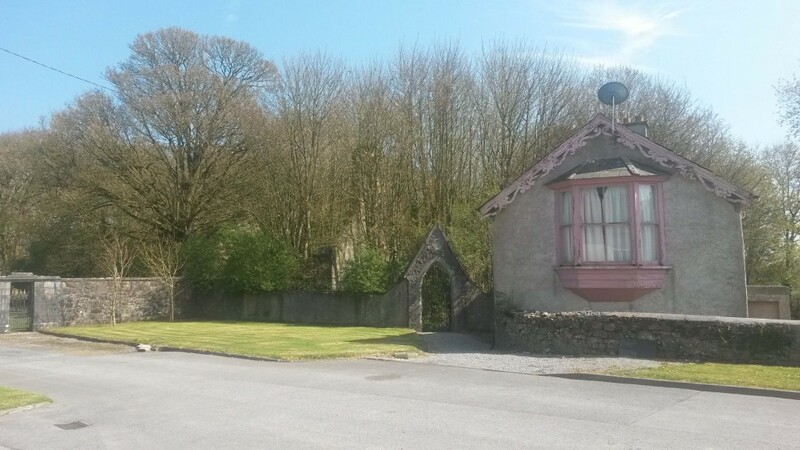 In accommodating the eastern gates at the village entrance Duffy’s cottage was demolished. Certain works were undertaken as part of a State-sponsored employment scheme in the 1980s, comprising for the most part the cleaning of the graveyard and the straightening up of a number of headstones. Works on that occasion did not touch on the fabric of the church proper. The 1677 Eyre church and its graveyard are in private ownership and are inaccessible to the public. [i] Certain other existing Medieval or late Medieval churches such as that located at Kilreekil was used for Protestant services in the early decades of the seventeenth century but were constructed prior to the Reformation and had previously served the Roman Catholic population. [ii] Variously given in the seventeenth century as ‘Killinehy’ and also ‘Killenno als Killmigha Bodella & Kildalaffy’ or Killeny. [iii] O Donovan, J. and others, Letters containing information relative to the Antiquities of the County of Galway. Collected during the progress of the Ordnance Survey in 1839. Vol. 2, letter no. 4, Loughrea, dated 3 November 1838. [iv] 15th Annual Report of Records of Ireland, p. 358. [v] NLI, Dublin, G.O. Ms. 87, Draft Grants E, c. 1630-1780, pp. 75, 115. Funeral Entry of John Eyre of Eyrecourt; Cronin, J., A Gentleman of a good family and fortune: John Eyre of Eyrecourt 1640-1685, J.G.A.H.S., Vol. 60, 2008, pp. 88-115. [vi] Hartigan, Rev. A.S., A Short Account of the family of Eyre of Eyrecourt and Eyre of Eyreville in the County of Galway, Reading, n.d.
[vii] Gantz, I., Signpost to Eyrecourt: Portrait of the Eyre Family, Bath, Kingsmead, pp. 127-8; Cronin, J., A Gentleman of a good family and fortune: John Eyre of Eyrecourt 1640-1685, J.G.A.H.S., Vol. 60, 2008, pp. 107-8. [viii] Gantz, I., Signpost to Eyrecourt: Portrait of the Eyre Family, Bath, Kingsmead, pp. 127-8. [ix] King’s County Chronicle, 30 September 1868, p. 2. [x] Miscellaneous Papers, Ireland; Established Church; Linen; Grain; Trade, etc., Session 21 April to 23 November 1820, Vol. IX; State of the Established Church of Ireland, Diocese of Clonfert and Kilmacduagh, pp. 127-140. [xi] Miscellaneous Papers, Ireland; Established Church; Linen; Grain; Trade, etc., Session 21 April to 23 November 1820, Vol. IX; State of the Established Church of Ireland, Diocese of Clonfert and Kilmacduagh, pp. 127-140. [xii] Lewis noted that Protestant divine service was also performed in a school-house in the parish of Killimorbologue. [xiii] This road was shown on Ordnance Survey maps as Church Lane while the early nineteenth century church was still in use and prior to the construction of the Church of St. John the Baptist in the 1860s. [xiv] O Donovan, J. and others, Letters containing information relative to the Antiquities of the County of Galway. Collected during the progress of the Ordnance Survey in 1839. Vol. 2, letter no. 4, Loughrea, dated 3 November 1838. [xv] King’s County Chronicle, 30 September 1868, p. 2. [xvi] King’s County Chronicle, 30 September 1868, p. 2. [xvii] Dr. C. Cunniffe, Clonfert. [xviii] Gantz, I., Signpost to Eyrecourt: Portrait of the Eyre Family, Bath, Kingsmead, pp. 127. [xix] Luke Duffy rented a gate lodge in the townland of Kilnaborris about 1950 and later resided at this gate lodge in Eyrecourt.